Pickering TG, Hall JE, Appel LJ, Falkner BE, Graves J, Hill MN, Jones DW, Kurtz T, Sheps SG, Roccella EJ; Hall; Appel et al. (2005). "Recommendations for blood pressure measurement in humans and experimental animals: Part 1: blood pressure measurement in humans: a statement for professionals from the Subcommittee of Professional and Public Education of the American Heart Association Council on High Blood Pressure Research". 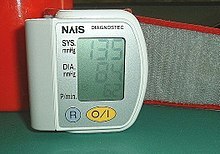 Hypertension খণ্ড 45 (5): 142–61. doi:10.1161/01.HYP.0000150859.47929.8e. PMID 15611362. http://hyper.ahajournals.org/cgi/content/full/45/1/142। আহৰণ কৰা হৈছে: 2009-10-01.